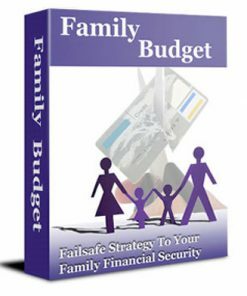 Family Budgeting PLR Autoresponder Messages comes with everything you need to build and email marketing list and many extras all with private label rights. Miscellaneous Graphics: PSD’s so you can brand it as your own product! I don’t have to tell you that money is tight for many people these days and the state ot the economy isn’t helping matters. More than ever, families need to take control of their finaces and learn how to control their money. Far too many families are living on the edge, barley keeping their heads above the creeping debt that’s ready to swallow them up. I don’t have to tell you that, This is a real issue and many people are desperate to get thing sworked out and save their homes or cars. The fact is that many people don’t know how to save or budget their money, they don’t know how to control their spending. Here is your opportunity to show cash-strapped folks how to budget, save and control the money coming in, and you make some nice profits while helping others. Everything has already been written for you, with high quality content and important reliable information your readers are searching for. You almost instantly become an expert and go-to person when it comes to budgeting and controlling finaces. Even if you have little to no experience on the subject. I don’t have to tell you that there is almost an endless supply of products you can promote to people who need to budget their money. From digital products such as ebooks to videos, even the large product line of physical products such as books, which means you won’t run out of products to promote any time soon. 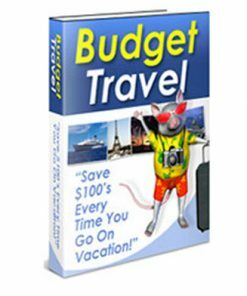 The Family Budgeting PLR Autoresponder Messages package includes everything you need to get started building a large and profitable Budgeting list and communicate with that list on a regular basis. With each well written messages you’ll build trust with your readers which means you’ll have a better chance of them reading each email and buying what your selling. They will look at you as the expert or authority, the go-to person when it comes to budgeting, saving money and controlling finances. You’ll get a well done, ready-to-go Family Budgeting 101 squeeze page and matching confirmation web page. Just add your Opt-in code, upload the web pages and it’s ready to start building a list for you, all on auto-pilot. These are ready well crafted web pages, with high quality matching graphics. 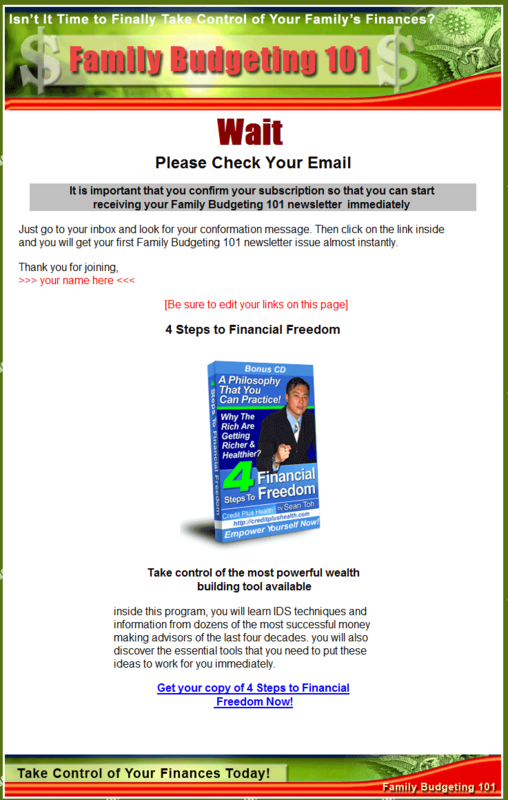 You will be getting 12 Pre-Written High Quality Family Budgeting PLR Autoresponder Messages dedicated to Family Budgeting. Add your promotional links or your affiliate links, any links you want for that matter, copy and paste the messages into your Autoresponder series and it’s ready to go. 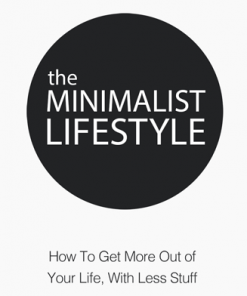 It doesn’t get much easier and saves you all kinds of time! You’ll even get a blank message template to add even more messages to your autoresponder series. this package even comes with a legal disclaimer template/message to cover yourself. The messages are all pre-formatted to 65 charactors to save you time, no formatting needed, it’s already been done for you! These messages are high quality with a large amount of text, over 7,500 words of high quality text content! 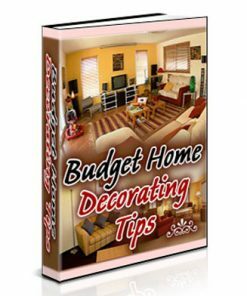 Great Tips for Your Family Budget! Budgeting Tools that Really Work! 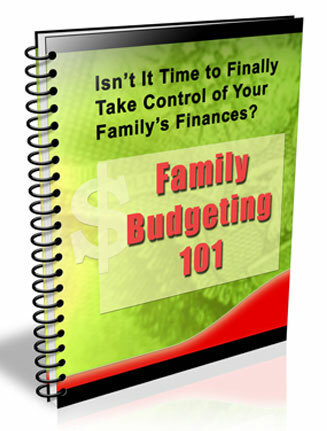 Family Budgeting PLR Autoresponder Messages come in both TXT and Word Doc for easy use. Each Message contains a closing hook at the end of each email message to keep your subscribers looking forward to your next message, which of course, can mean a much more responsive list for you! You’ll also be getting pre-made Family Budgeting Clickbank ads you can quickly and simply copy and paste into the messages where ever you want. Just Insert your Clickbank affiliate Id and they are ready to go. There are 3 different Digital Products with 4 high quality ads for each product, 12 ads in total. Over 1200 Words. That’s OVER 2,800 Extra Words of High Quality content that’s sure to hook your readers and keep them reading every single one of your emails. You’ll be getting over 10,300 word of pure Family Budgeting PLR Autoresponder Messages content in this series. 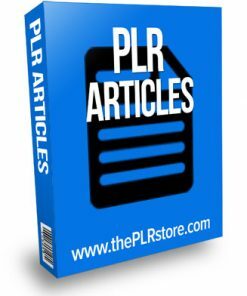 The extra opening and closing could even be used at the beginning and the end of existing plr articles to make them more unique with very little extra work, just simply copy and paste. Or use the titles to split test your emails to gain the maximum open rate. Or put them in your blog posts to gain more readers. The uses are endless. Confirm web page even includes a Budgeting Related Digital Product offer, the perfect opportunity to make some extra dollars while building your list. You could be getting paid to build your own list starting today! It even comes with PSD image files so you can brand the graphics exactly how you want. Add your name or your website url, it’s totally up to you. You make it look like your very own product. 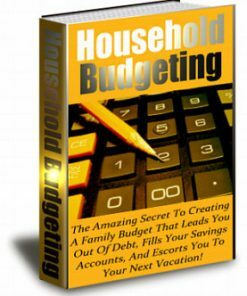 You could use this Family Budgeting Autoresponder Series as a brand new message set or add them to a series you currently have running for extra messsages and even more opportunities to sell more to your growing list. Are You Ready to Finally Take Control of Your Family’s Financial Future? Inside each issue, you will receive easy to follow information that you can use to help you evaluating your finances, create a solid budget and sticks to it. You will have access to simple facts, tips and information that can help you on your way to reaching your financial goals and dreams. So that you can secure were a safe secure future for your family! How to successfully save and budget your money. How you can finally take charge of your families finances by working together. The advantages of using money budgeting software. And that’s just the beginning. 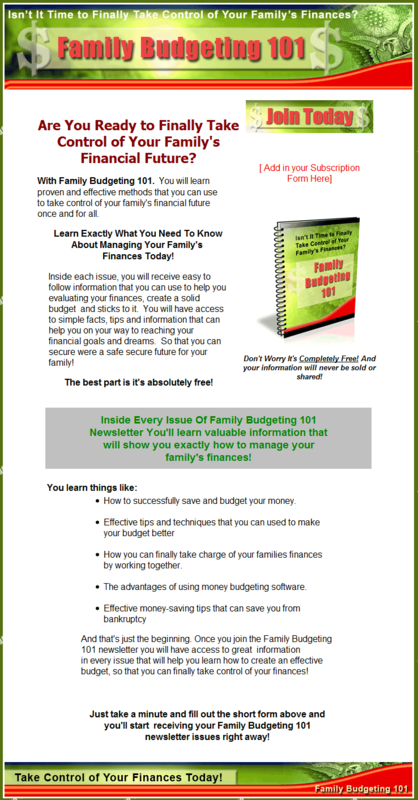 Once you join the Family Budgeting 101 newsletter you will have access to great information in every issue that will help you learn how to create an effective budget, so that you can finally take control of your finances!